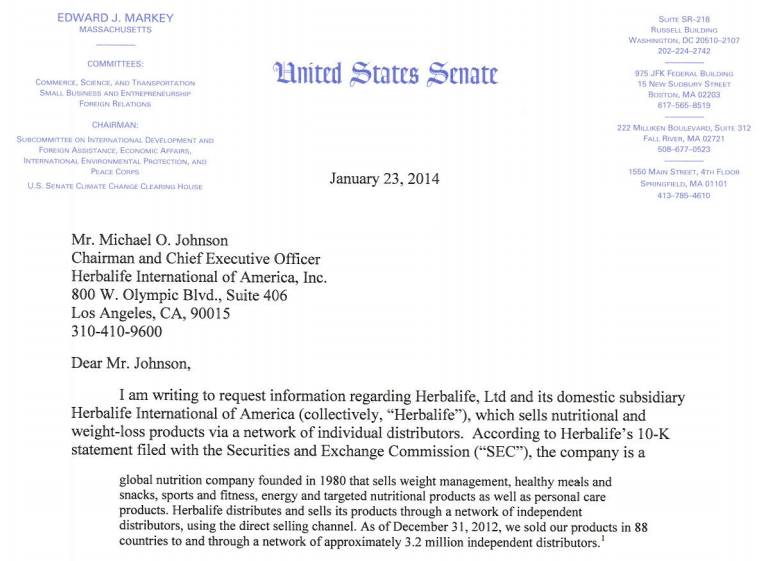 Earlier today I posted two versions of Senator Edward Markey's letter regarding Herbalife. Read that post first. The Bill Ackman version was dated January 22, 2014. 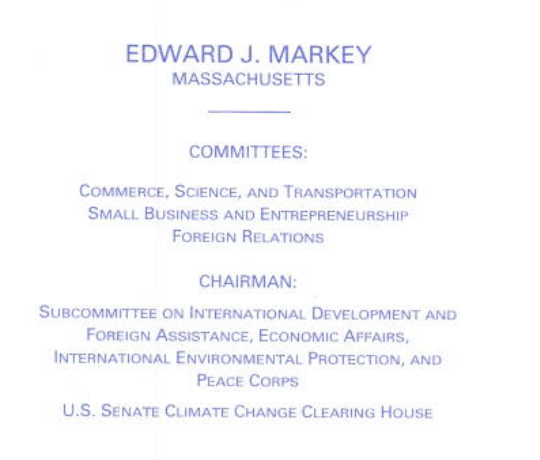 The Edward Markey version was dated January 23, 2014. This letter was highly market sensitive, and trading on it in advance would be insider trading under either the Stock Act or the Supreme Court decision in the R. Forster Winans case. I have no evidence however that anybody traded. I only note the sensitivity of the letter. I also tartly noted that Michelle Celarier's New York Post article on Senator Edward Markey's letter had the letter dated January 22, 2014 - the same date as the letter on Bill Ackman's website. This caused a minor stir in the Twittersphere. 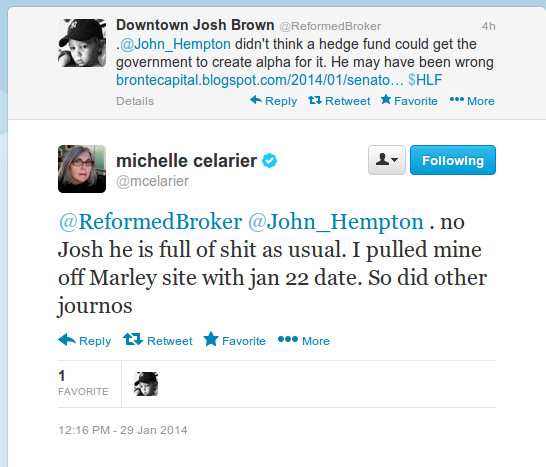 Witness this exchange between Josh Brown and Michelle Celarier. As Michelle Celarier has called me "full of sh-t as usual" I feel the need to defend myself. I note, other than the date, there is one substantive difference between the letters on Ackman's website and the one on Markey's website. Note that the signature is in grey. 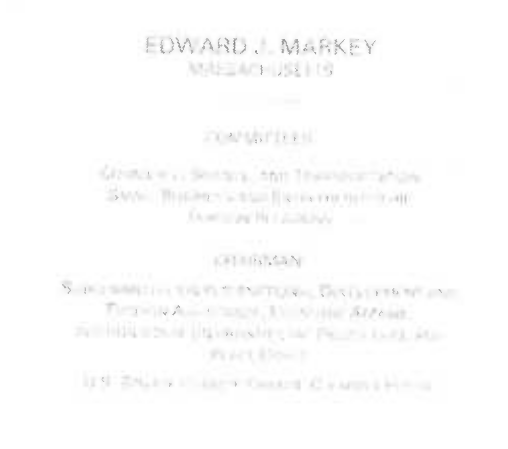 And here is the signature block on the Markey-website letter. Note that the signature block is in blue. I have checked many letters on Senator Markey's website. As far as I can tell he always signs in blue. The conclusion I have is that the letter on the Ackman website is a scanned letter. The document properties are also different. The Markey version was produced on a Hewlett Packard MFP. 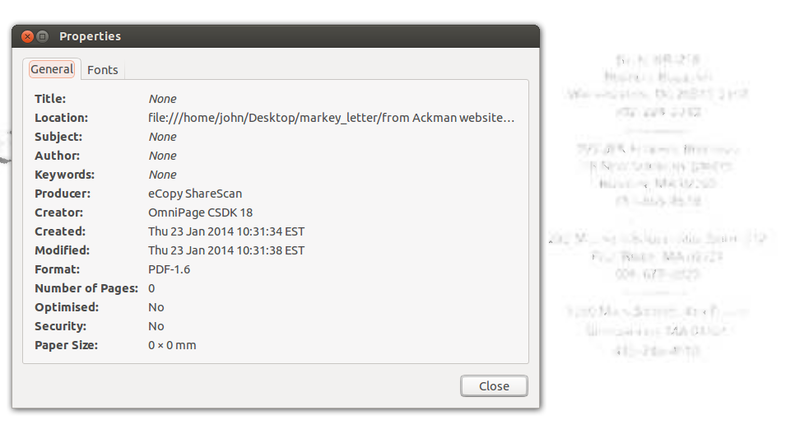 The Ackman-website version was produced on an eCopy ShareScan. The letter put up by the New York Post was not the original letter. It was a scanned letter. 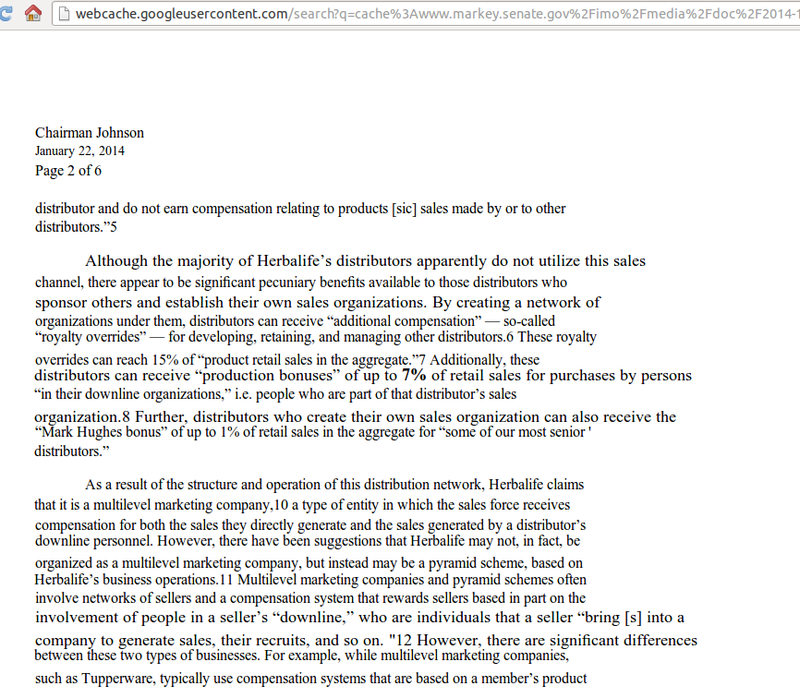 It was also produced on an eCopy ShareScan and it has the same legibility issues as the Ackman-website letter. Michelle Celarier is likely mistaken about where she got the letter from. An update is warranted: Google Cache clearly shows a letter dated January 22 was at one stage on Senator Markey's website. However this does not obviate the fact that Michelle Celarier's copy of the letter was a scanned copy with Pershing Square consistent metadata. However it does remove some suspicion as to timing of receipt of the copy. Long ago I thought that Bill Ackman's thesis on Herbalife was silly. It was "I am a billionaire hedge fund manager and I can get the government to help me". A year later and Bill Ackman has managed to get a Senator to help him. Edward Markey (Democrat, Massachusetts) famously raised "the Herbalife issue". It whacked the stock. I confess I might have been wrong. Actually with respect to Markey I am wrong. 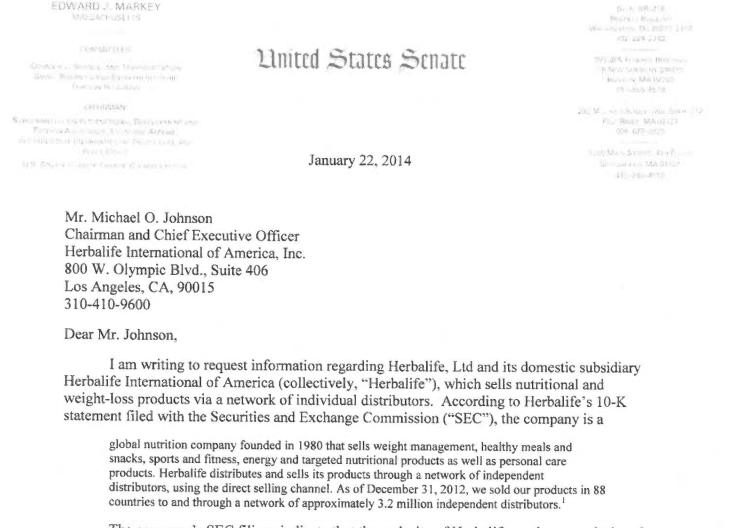 There are TWO versions of the Herbalife letter. One is from Bill Ackman's website. You will note that it is dated January 22, 2014. It is dated January 23, 2014. I would normally comment no further, but I can't help myself. You see the version the New York Post carried under the Michelle Celarier's byline is the Ackman version. It can't hurt their cause that Markey is demonstrated to be the tool of billionaire Wall Street types. Facebook has become totally unusable to me. There are a small number of people I don't communicate with every day - but who are old friends or were friends and I want to keep the option of re-contacting. Also family. Having 250 plus Facebook friends who met me professionally or through this blog eventually made Facebook meaningless. I didn't use it any more. Besides I don't really have 300 friends and nor do most of you. And I don't really know the 3000 people in my Google contacts. So, dear readers, I unfriended you all. Facebook revenue is still rising fairly fast. Relevance is another matter. No position in the stock. Was long a while ago - but stuffed the timing up for small profits. When you think the big four audit firms can't get any worse be prepared to be disappointed. The stock in the Wolf of Wall Street (Steve Madden Shoes) has been a thirty bagger. It is also a challenge to the Bronte business model. Steve Madden - the designer of the ridiculous high-heeled shoes beloved by teenage tarts - gives me nightmares. And every time I go to my office in Bondi Junction (Sydney, Australia) I pass - at the entry foyer - a far-flung outpost of Steve Madden Shoes - a reminder of the risks in my business. I short stocks - and whilst I carefully examine the accounts and sometimes even stake out factories - mostly I find shorts based on people. Brokers and stock promoters with a history of fraud interest me. Lawyers are my favorite of all scumbags because some do the documentation for fraud after fraud after fraud and lawyers seldom get pinged. Stock promoters come-and-go. Lawyers are eternal! I will short a stock (in very small quantity) based on an association with one suspect lawyer and one suspect promoter. I read the accounts if the stock goes against me - and depending on what I find I either increase my position or cover. If the stock just goes down (which it often does) I just take the profits and wish I had shorted more. When one goes against me I think - yet again - of Steve Madden and his tarty shoe company. Steve Madden is my eternal nightmare. Stratton Oakmont was arguably the most fraudulent stockbroker ever to operate in the United States. Its founder (who went to prison) wrote about it in agreeable first person: The Wolf of Wall Street is a tale of high class hookers (known as "Blue Chips"), Quaaludes and stock fraud. Every stock taken public by Stratton was a disaster and a fabulous short. They all crashed and burned. Every stock that is except one. The except one is Steve Madden Shoes (SHOO:Nasdaq). And even that was a close-run thing. Steve Madden was a small-time shoe designer going nowhere and frustrated with his lot working for larger shoe companies. He struck out on his own. But Steve did not just go to Wall Street, he went to his childhood friend Danny Porush. Danny was senior at Oakmont Stratton and Steve Madden shoes was dressed up in classic Stratton fashion. In other words the company was over-promoted (even fraudulently promoted) and the stock was manipulated. Jordan Belfort (the CEO of Stratton) had large undisclosed positions (he admits this in his book) and was actively involved in the manipulation of the stock. Eventually the manipulation scheme comes crashing down. Steve Madden is charged with stock fraud and pleads guilty. He went to prison. Usually this is the profitable end of a fraud-short. Usually, but not always. Something strange happened on the way to the stock fraud. That something was Steve Madden. 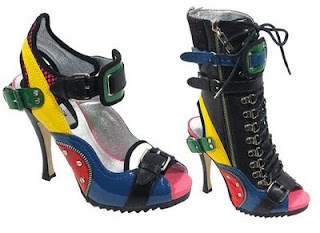 Madden always was first-and-foremost a shoe designer and an outrageous and outrageously successful one. Even by the time Madden was charged Steve Madden Shoes was on its way to being the most successful high-heel shoe company in the world. Teenage girls just love him. And Madden - from prison - retained his role as design guru for the company. Beyond prison he is back in the saddle - and the success continues. The stock goes up because Steve Madden is good at what he does. The stock is a 25 bagger. I see fraud in accounts regularly enough. There is no trouble finding fraudulent companies and if you picked Steve Madden as a short you had indeed found a fraudulent company. But it hardly helps. The money raised by stock fraud at the beginning of Steve Madden Shoes nourished the growth of a truly successful (and valuable) business. Shorts - and there were plenty of shorts - had a really bad time with this one. Every company I short I have to ask myself - even if I am sure this is dodgy - how do I know I do not have the next Steve Madden? To me that is the stuff of nightmares. And here - just to rub it in - is a picture of Steve Madden with Katy Perry. Not only did he get the loot - but he seems to have got the girls as well. As a short-seller photos like that just rub salt into wounds. The promised correction: I have now been followed on Twitter by Wendy Madden, Steve's wife and the mother of his children. He seems to have got the girl, but it wasn't Katy Perry. Often I look at my short-book, a collection of scum, vile and villainy. And I wonder if under it all there is one or two decent people, another Steve Madden. I guess there is - but I will have to lose five times the initial stake on one or two shorts to find out. As an investor you can be wrong in ways you never imagined. As a portfolio manager you have to allow for it. Bronte Capital's office are in the tower above the Westfield Shopping Centre in Bondi Junction, Sydney, Australia. From there I scoured the world looking for Chinese stocks to short. And until today I never noticed Mazu Alliance which is above the same shopping complex as Bronte. Mazu Alliance is within a couple of floors of where we will be setting up our new expanded office. Mazu Alliance's business is religious shrines and ancillary activities including "development of the premier site for the worship of the goddess Mazu in Fujian province, China". I have never seen religious sites traded in public markets, and if Mazu does exist then she is notably uninterested in or powerless to benefit her Alliance's external shareholders. The company has not found the money to pay their listing fees and the stock is not trading. To strengthen the Company’s operations in the development of its 3,600 private temples and cultural halls, the Company is forming key strategic partnerships with aligned Taoist and Buddhist faiths. In furthering this strategy, the Company is appointing internationally recognised religious dignitaries as advisers to the Company. The Company announces that Mr Taochen Chang has been appointed as the Company’s Taoist Chief Adviser commencing on 1 January 2014. Mr Chang is the ‘Heavenly Master’, a title originating with the Eastern Han Dynasty. The position of ‘Heavenly Master’ is allocated to a religious head of the Taoist movement. Taoism has influenced Southeast Asia for over 2,000 years and has also spread internationally. Mazu is a deity in Taoism. In each generation, the position and title of ‘Heavenly Master’ was bestowed by the emperor of the time. The position has been passed through 64 generations, and Mr Chang, a 64th generation descendant of the family, is the current Heavenly Master. He has an extensive group of followers, and is recognised in Taiwan, Southeast Asia and internationally. Still, I wonder about my strange blindness that allows me to navigate through obscure Chinese stocks listed in Canada and ignore the operators who probably queue with me for my morning coffee. I first heard of Xero from a friend, an executive management team member of a US tech giant. [Think a direct report of the CEO of Google, Microsort, Intel or Apple or similar.] He had invested about a fifth of his (not inconsiderable) personal wealth in an obscure software company in of all places New Zealand. Needless to say I purchased some (albeit way too little) and then investigated. Xero is a cloud accounting software company - essentially doing what Intuit or Sage do but entirely in the cloud. Cloud software in this case obviates the need for a server, computer support or any problems with scalability. But when I purchased the stock the valuation was absurd - the stock was trading at roughly 200 times revenue. The company also had large losses. Our core test was to try Xero for our own business: we like it. More on the excellence of the product later. Anyway the stock started going up fairly hard. She told me that every single New Zealand fund manager they used had underperformed the index because they had not held Xero, something they thought was absurdly valued but which had gone up sharply and then up some more. About this time three separate New Zealand fund managers contacted me (a known Antipodean short-seller) and suggested I short-sell Xero. I told at least one I owned it which somewhat shocked him. I have also had this conversation with some smaller Australian fund managers. Notably none of these fund managers had tried to use the product or had talked to anyone who did use the product. As I said, I have, and the product is life-changing good. I feel stronger about this product than (say) the first smart-phone I used. Its a dead-easy, simple to set-up version of Intuit or Sage or MYOB. It does your accounting, links to your bank accounts and allows you to manage your transactions. The set-up makes Intuit look ungodly-complicated. And, most tellingly, it winds up superior in every way to the "in-the-server-box solution". Bronte Capital Management by law has to pay roughly 10 percent of my salary to a superannuation plan (that is a private, regulated pension plan). I chose to put it in a plan set up for me by my old employer simply because it was there and I was comfortable with the way it was invested. When setting up the payment I tested deliberately putting in the wrong bank account numbers for the recipient. The computer immediately knew I had put the wrong number in. Why? Because maybe 50 people had previously put the right number in. The error systems were crowd-sourced. This sort of thing happens all the way through Xero. The system gets better and better. Changes developed for one party who has say an issue (cross border taxation complications for instance) wind up being available for all new parties. The market cap of Intuit is 21 billion. Sage is a further 6 billion. Add in MYOB (which is now private) and you get a global market cap for the sector well north of 30 billion. But the near-monopoly cloud player should be able to capture more value than this because they also displace the servers and computer support needed for an "in-the-box" solution. My guess is that fifteen years from now there will be a totally dominant cloud accounting software company with a value north of $50 billion. Needless to say Xero stock has continued to go up and its putting New Zealand fund managers on the spot. Their underperformance has gone from notable to embarrassing. Because they can't win this game they want to redefine victory: they are lobbying to get Xero taken out of the index. After all Xero is dramatically different from the rest of New Zealand which has an economy based on soft commodities (dairy, meat, wool and timber). And I understand their problem. It is the problem Canadian fund managers have had. Canada has had two globally important technology companies with huge market caps and a huge percentage of the index that have imploded. These were Nortel and Blackberry respectively. The former actually went to zero having been a quarter of the index. If a Canadian fund manager was underweight Nortel or Blackberry they had embarrassing under performance on the way up. If they were long for the collapse they had terrible absolute performance. For Canadian fund managers it was a tricky situation. But I am not going to cede this argument to the precious (under performing) petals of New Zealand funds management. Indeed I want to argue the opposite. But the internet and globalization have flattened the structure. It is possible to become a world leader and stay in Wellington or Christchurch these days. See Peter Jackson for an example. And it is possible to run a world-beating software company from Wellington too, but only if it can be funded from Wellington and only if the local market is outward focussed enough to make this possible. Xero is not the only example. Jade is an important company based in Christchurch but it is privately held. In arguing for taking Xero out of the index the New Zealand fund managers are demanding that the globally aware outward looking and creative people leave New Zealand to get funded. As an Australian I like that idea. The best of New Zealand talent will continue to come here to our great benefit. Kiwis can (vainly) claim them as their own - but it won't matter. Their economic contribution will be to Australia. What the New Zealand fund managers are arguing for is an insular old New Zealand. A startlingly beautiful but somewhat backward place for Australians to visit when we can bother to put up with the inferior Kiwi weather. Those that determine the mix of the New Zealand index should simply ignore the hurt-feelings and lame excuses of under-performing fund managers. And to the Sovereign wealth fund. If your fund manager had underperformed the index because they did not own market weight in Xero (ie all of them) and they have not explored the software extensively themselves fire them. You should also fire them if they have argued for removing Xero from the benchmark. They are representative of the old, inward looking New Zealand that you should be leaving behind. PS. At the rate the New Zealand tech industry is growing, especially with companies like Xero, there is a chance than Kiwis will start to see Australia as a slightly backward place with good beaches and sunny weather. Personally I like it when the really entrepreneurial Kiwis come here. So maybe, for Australia's sake, I should reverse the recommendations above. For accuracy sake: there is no such thing as a NZ Sovereign Wealth Fund, but there is a large managed government pension fund which - to confuse anyone not from the Antipodes - is called a "superannuation" fund. I recently wrote a long letter to Deloitte about a company audited by Deloitte in which I thought there was a possibility that the accounts were fake. I specifically told them that I was keeping the letter confidential and that they should do the same. This was explicitly a speculative letter. Moreover if the speculations were right then the company in question was controlled by criminal elements. However there was a reasonable chance that I was wrong - and so general publication - especially on this blog - was not reasonable. I wrote to Ms Simpson and asked whether blowing the cover of anonymous whistleblowers was standard practice. I was the person who wrote the letter that caused Longtop Financial Technology to implode - a major failing for Deloitte. I have previously written partially defending Deloitte for that mistake. Maybe I was too generous. Normally I do not bother wasting my time with class-action lawyers. Lousy ambulance chasers in the securities arena - a wart on the capital markets. But not as much a wart as audit firms. If and when this company blows (and it is by no means assured) up I will consider it my "professional duty" to cause Deloitte as much difficulty re this audit as possible. My material (and it is extensive) will be passed to class action lawyers and I will gratis testify against Deloitte. Indeed I look forward to it. I also look forward to the apology from Ms Simpson's managers vis her indiscretion. Post script: there are several people (including Professor Gillis) who think the auditor did what was legally required of them. My experience is that the letter I received from Deloitte is unusual - but if that is what is required of auditors I will never write to the auditor using my own name again (though I will use disclosed fake ones). I will also - just to add insult to auditor injury - write a copy to a friendly securities class action lawyer - who will then have a leg-up on any cases - and who I suspect will treat the letter with the confidentiality it deserves - at least until confidentiality can be broken. Anyone want to be the friendly securities class action lawyer?